I started working here in May 2017. My passion always has been working with animals and now I get to do what i love! 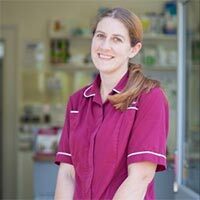 As nurses we are always trying to provide a home away from home for your pets and give them the best possible care, the reward is seeing them back with their families. I have also worked in South Africa in a rehab centre, while I took a previous course. I love exotics and have a range of pets including a tortoise, corn snake, degu and even a few thousand bees! A cuddle with my dog Kano, a Lab/Husky/Rottie mix is the perfect way to end the day.